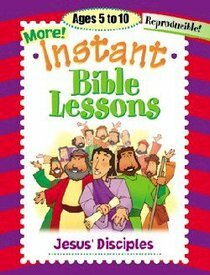 - Publisher More great lessons following up on our best-selling series Intant Bible lessons! From puzzles and games to crafts and snacks, each interactive lesson provides teachers with flexibility as they shape the Bible message for kids ages 5-10. 96 pages. About "Jesus Disciples (Reproducible) (Instant Bible Lessons Series)"
More great lessons following up on our best-selling series Intant Bible lessons! From puzzles and games to crafts and snacks, each interactive lesson provides teachers with flexibility as they shape the Bible message for kids ages 5-10. 96 pages. Kuhn has written more than 40 books with prominent Christian publishers. She is currently the director of children's ministries and VBS at her church.